After crossing the Mongol Rally finish line in Ulan Ude, Shane and I spent a few days resting and recovering from our adventures. We took Martha to meet her new owners – team Coddiwomples – and sorted out the paperwork to enable them to drive her out of Russia and back to Europe (or so we thought… more to follow on that in our next blog post). On our last Saturday night in Ulan Ude we met up with the Adventurists and several other teams for the final Mongol Rally finish line party. This was held at an interesting (slightly dodgy on the outside, still slightly dodgy on the inside) club in Ulan Ude, and with free beer and free vodka flowing for several hours, it was a messy night. Sensing things were getting a little out of hand, we made a reasonably early exit while we were still sober enough to find our way back. After a few days of recovering, celebrating and saying a tearful goodbye to Martha, Shane and I were ready to start the next phase of adventure. We walked the short distance from our hostel to Ulan Ude station and boarded a train to Vladivostok. Vladivostok is a port town on the South Eastern tip of Russia. It is over 9,000km away from Moscow, and in a time zone seven hours ahead. It is closer to Alaska than it is to Europe, and it is the last stop on the Trans-Siberian railway. 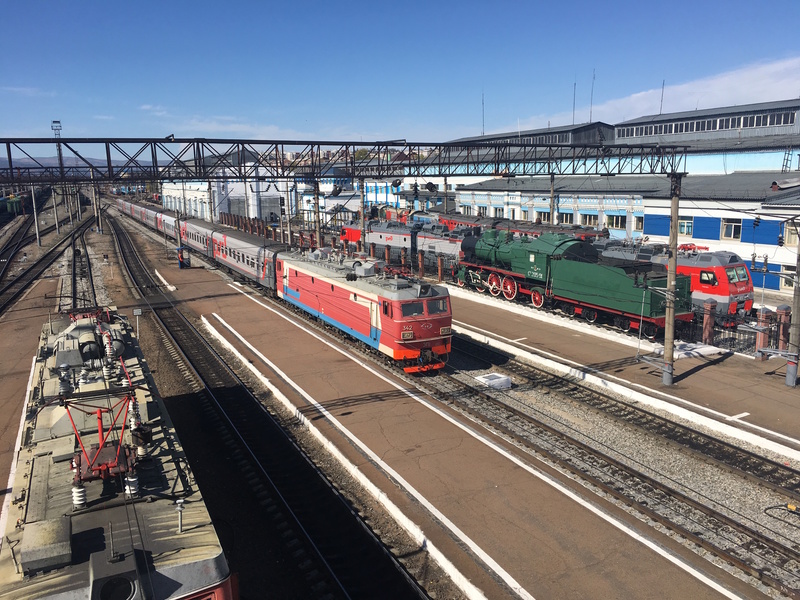 Despite the fact that Shane and I had driven for a long way East to get to Ulan Ude, it still took 60 hours on the train to reach Vladivostok. It felt as though we were heading for the end of the world. 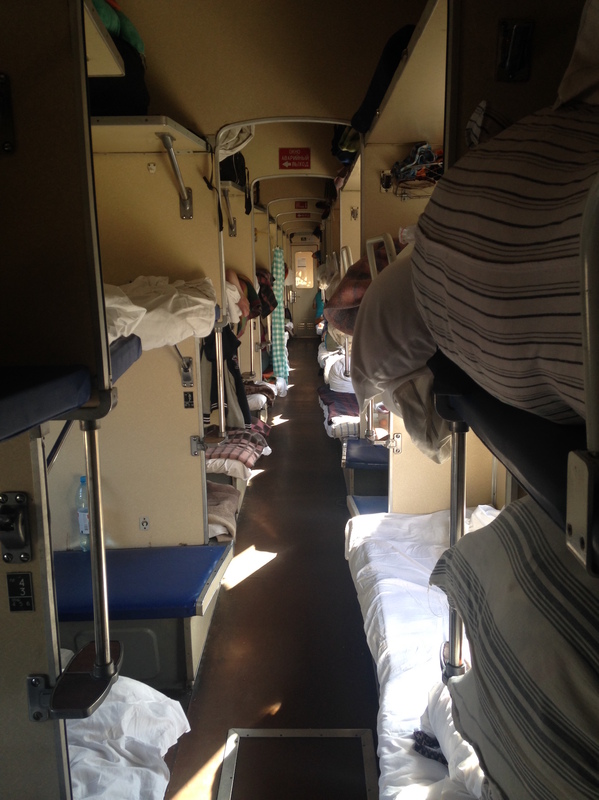 Our experience on the Trans-Siberian railway was fairly pleasant. We bought third class tickets – the price of second class being twice the price – and we were glad we did. Not because third class was so great, but because second class wasn’t much better. We found our way to our carriage and to our living space for the next three days. Shane had the ‘bottom bunk’. This was a seat with a table during the day and could be made into a bed at night. I had the top bunk just above him. It wasn’t the easiest bunk bed to climb into and had pretty much zero headroom, so was fine for sleeping but not for reading or lounging or anything else. The main difference between third class and the other classes was that your living and sleeping space is completely shared with everyone else. The carriage is basically an open plan dormitory. There are no partitions or barriers between you and the other fifty or so people in your section of the train. In second class you have a small compartment, shared with three other passengers, while in second class you share with just one other person. Second and first class give you more privacy and a little more luxury (the bedding looked nicer), but otherwise there was little difference between the classes. The journey itself was fairly uneventful. We sat on the train and read, listened to music, stared out of the window, ate pots of mash potato and tried to overcome the language barrier and communicate with our fellow passengers. One evening, the man sitting opposite us drank two bottles of vodka, became a little rowdy (to the extent that Shane found his pen knife and hid it, just to be on the safe side), and then fell asleep. Shane then had to wake him up at around 2am to make sure he didn’t miss his stop, help him off the train and give him his penknife back. 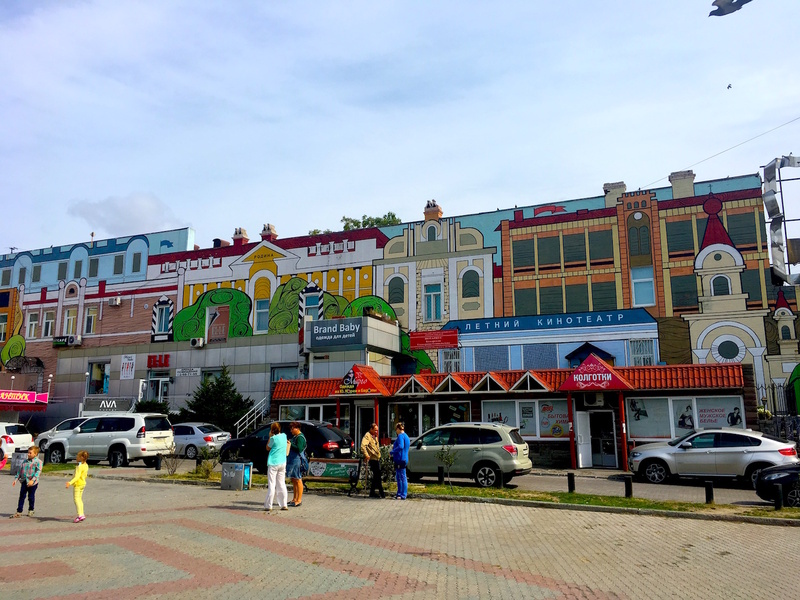 After two and a half days in our confined space and three nights of broken sleep (trying to sleep on a moving, noisy train wasn’t easy at the best of times, but we also had a few snorers in close proximity), we were relieved to reach Vladivostok. We enjoyed our trip on the Trans-Siberian railway, but we enjoyed getting off the train even more. 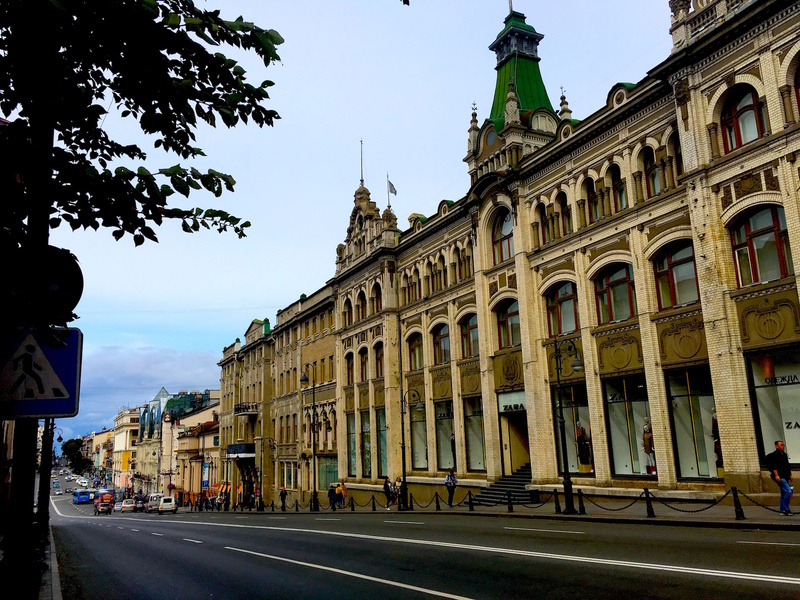 From our (admittedly limited) research of Vladivostok, we were expecting to arrive in a dreary, drab, grey town at the end of the world. In fact, Vladivostok was entirely different. The architecture was pretty and diverse, the people were trendy and friendly, and there was a real buzz about the place. 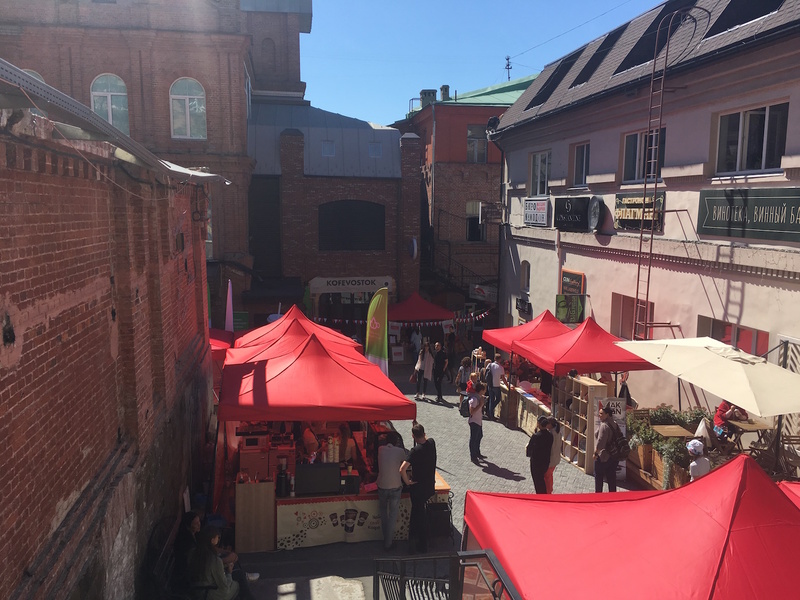 Funky coffee shops, jazz bars and pop-up shops filled the streets, and we felt even more scruffy and out of place in our travelling clothes than usual. On our first day in Vladivostok we headed straight for the sea. This wasn’t difficult – you can sea the see from pretty much everywhere in the city – and we soon found a thriving seaside area dotted with ice cream vans and candyfloss stalls. We sat for a while and looked at the ocean, marveling at the fact that we had now crossed all the way from the Atlantic to the Pacific in two months without getting on a plane. We hadn’t seen the “real” sea since Dover (not counting the landlocked Black Sea or Caspian Sea), and so we enjoyed being by the seaside and watching the waves. 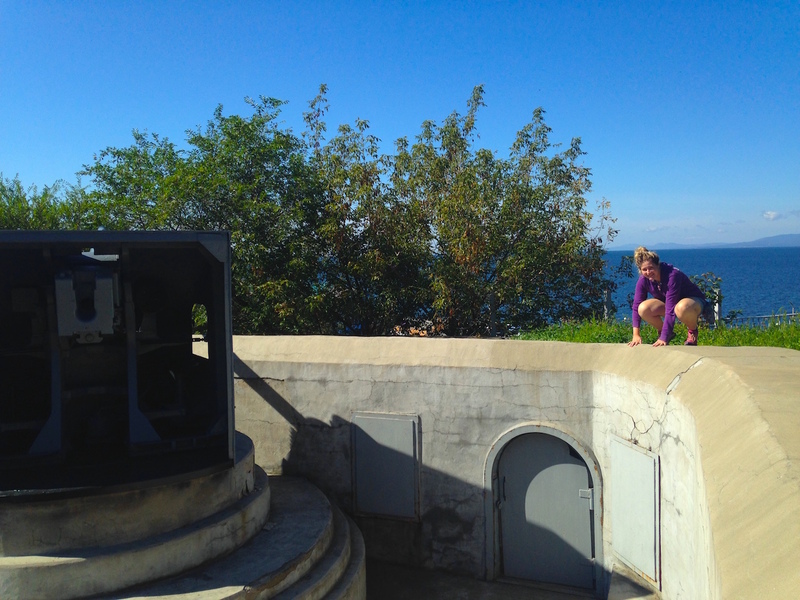 Next we explored Vladivostok Fortress, which was built right by the sea in around 1900. Wikipedia describes the fortress as “one of the most powerful maritime fortresses in the world”, and it played a significant defense role in the First World War. We saw a variety of heavy-duty weapons and explored a maze of underground tunnels. Shane was in his element. On a similar theme, we also visited an old Russian submarine. We were allowed to go inside and visit the engine rooms and see typical crew bedroom, which was a bit like visiting an adventure playground as it involved climbing through small holes in the walls and floors. Next we decided to treat ourselves to a one-hour cruise around the bridges and islands South of Vladivostok. We had decided to get a public ferry to one of the islands, but once we reached the port we discovered this is no longer possible. Our only option was to take a tour around the bridges of Vladivostok, which would also give us a view of the island and various other landmarks, including the lighthouse. Unfortunately the tour was several times more expensive than the price we were expecting to pay for the non-existent public ferry, but we decided there were added benefits to doing the little tour, and enthusiastically bought tickets for the next boat. At first we wondered whether we had got on the right boat. To say our cruise tickets had been miss-sold would be something of an understatement. We embarked on an old tug-boat with limited facilities and a huge number of other tourists. It was standing room only, and even then it was difficult to get a look at the view. Not that it mattered, since we didn’t really go anywhere – we merely sailed out a short distance from the port, and then sailed back. 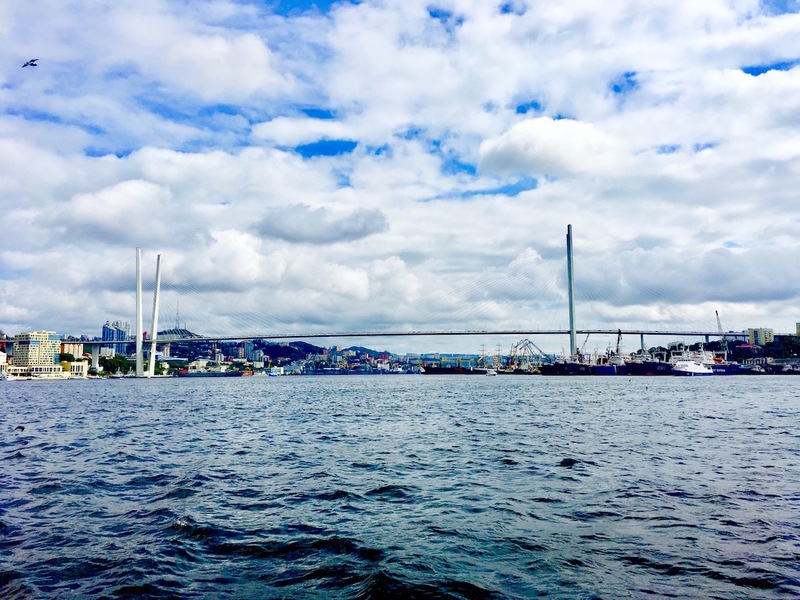 We did see the “bridges” of Vladivostok (well, we saw one bridge twice), and we think we might have seen the island… we’re not sure… but we didn’t see a number of the other promised sights and certainly didn’t get any sort of “tour”. But this was our only negative experience in Vladivostok, and was outweighed by the positive and vibrant atmosphere in the city. We enjoyed decent food, met friendly people (a rarity in Russia) and enjoyed the seaside (from land). When it was time to board our plane to South Korea, we didn’t want to leave. Vladivostok might be a small city at the very edge of the world, but as we left our days of driving and old Mongol Rally lifestyle behind, we could feel that it marked the beginning of a new kind of adventure and a different sort of travel experience – one that we were more than ready for.